The global reusable plastic water bottles market has shown a steady growth trajectory in the last few years and is likely to carry promising prospects into the 2017-2022 forecast period. The reusable plastic water bottles market has made strong gains on the back of the growing demand for packaged water in developed countries as well as the rising awareness regarding the environmental impact of widespread plastic usage. High density polyethylene is likely to remain the material of choice in the global reusable plastic water bottles market, while the expanding Asia Pacific except Japan market is likely to remain the dominant regional contributor to the global reusable plastic water bottles market. The report provides a comprehensive look at the workings of the global reusable plastic water bottles market by analyzing the historical trajectory of the market. According to Transparency Market Research, the global reusable plastic water bottles market is likely to reach a valuation of US$3.2 bn by the end of 2017 and further rise to more than US$4 bn by the end of 2022. The global reusable plastic water bottles market is segmented by material type into high density polyethylene, low density polyethylene, polycarbonates, and others. Of these, high density polyethylene is likely to dominate the global reusable plastic water bottles market over the 2017-2022 forecast period due to the high suitability of the material for bottle production. Reusable plastic water bottles made from high density polyethylene accounted for 39.8% of the global reusable plastic water bottles market in 2017, with the segment being valued at close to US$1.3 bn. Valuation of the high density polyethylene market is likely to rise to US$1.6 bn by the end of 2022, with the segment expected to account for 39.5% of the global reusable plastic water bottles market. The high density polyethylene segment is expected to exhibit a CAGR of 4.3% over the 2017-2022 forecast period. Geographically, the report segments the global reusable plastic water bottles market into North America, Latin America, Europe, the Middle East and Africa, Asia Pacific except Japan, and Japan. Asia Pacific except Japan is likely to remain the dominant contributor to the global reusable plastic water bottles market over the 2017-2022 forecast period, with the reusable plastic water bottles market expected to exhibit a robust 5.6% CAGR over the forecast period. The Asia Pacific except Japan reusable plastic water bottles market is expected to rise to a valuation of more than US$1.1 bn by the end of 2017. The robust CAGR of the reusable plastic water bottles market in the region is likely to see it gain 195 BPS by the end of 2022. Europe is also likely to remain a leading contributor to the global reusable plastic water bottles market, with the regional market expected to exhibit a steady 4% CAGR over the 2017-2022 forecast period to reach a valuation of more than US$1 bn by the end of 2022. The global reusable plastic water bottles market report provides a comprehensive assessment of the global market’s growth prospects in the coming years. 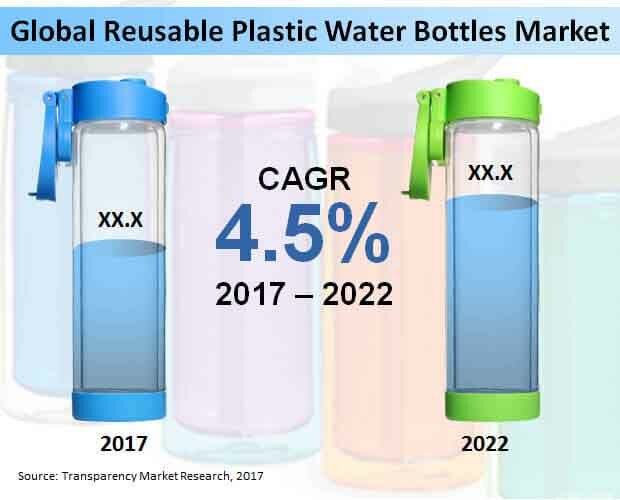 The report presents reliable forecasts about the reusable plastic water bottles market’s growth trajectory over the 2017-2022 forecast period on the basis of detailed assessment of the market’s growth figures from 2012 to 2017. The historical growth figures of the global reusable plastic water bottles market are provided in detail in the report, and the information is treated with industry-standard analytical models to derive projections about the way the various components of the reusable plastic water bottles market are likely to develop over the 2017-2022 forecast period. According to Transparency Market Research, the global reusable plastic water bottles market is likely to reach a valuation of US$3.2 bn by the end of 2017 and further rise to more than US$4 bn by the end of 2022. The reusable plastic water bottles market is expected to exhibit a strong 4.5% CAGR over the 2017-2022 forecast period. The report describes the vital drivers affecting the growth trajectory of the global reusable plastic water bottles market over the 2017-2022 forecast period. The key drivers aiding the reusable plastic water bottles market’s growth are described in detail to enable readers to acquire a clear understanding of the factors likely to enable smooth growth of their market operations. Analysis of the chief restraints operating on the global reusable plastic water bottles market’s growth is also given in the report in order to provide readers with acquaintance with the market’s key roadblocks. Analysis of the drivers and restraints of the reusable plastic water bottles market provided in the report is an invaluable document for market players in order to formulate strategies to make the most of the market’s key drivers while protecting their investment from the major restraints holding the reusable plastic water bottles market back. The report sheds light on the composition of the global reusable plastic water bottles market to enlighten readers on the way the various segments of the market are likely to shape up over the 2017-2022 forecast period. The report segments the global reusable plastic water bottles market on the basis of material, primary use, capacity, and sales channel. Leading materials used in the global reusable plastic water bottles market include high density polyethylene, low density polyethylene, polycarbonates, and others. By capacity, the global reusable plastic water bottles market is segmented into 0 ml – 500 ml, 500 ml – 1000 ml, 1000 ml – 2000 ml, and above 2000 ml. Leading sales channels in the global reusable plastic water bottles market include supermarkets/hypermarkets, online sales, independent stores, and other sales. By primary usage, the global reusable plastic water bottles market is segmented into everyday usage, sports, and travel and others. The report assesses the reusable plastic water bottles market’s progress in North America, Latin America, Europe, the Middle East and Africa, Japan, and Asia Pacific except Japan to understand the global reusable plastic water bottles market’s geographical distribution. Product catalogs and competitive strategies of major players in the global reusable plastic water bottles market are profiled in the report in order to provide readers with an accurate idea of the reusable plastic water bottles market’s competitive dynamics. Leading companies in the global reusable plastic water bottles market include Vista Outdoor Inc., Thermo Fisher Scientific Inc., BRITA GmbH, Tupperware Brands Corporation, Taiyo Nippon Sanso Corporation, ZheJiang Haers Vacuum Containers Co. Ltd., A. O. Smith Corporation, Implus LLC, Cascade Designs Inc., and Elite S.r.l.